SEOUL, Jan. 19 (Yonhap) — South Korea plans to develop military reconnaissance satellites and deploy five units by 2022 as part of efforts to beef up defense capabilities to better deter North Korea’s evolving security threats, military officers said Monday. The plan is part of the defense ministry’s policy goals for this year, which are focused on building a robust defense posture under the new paradigm of pursuing “a creative defense system” by maximizing advanced information technology. "The state arms procurement agency will sign a contract with a private company for the project in October, and its development is to be led by Agency for Defense Development (ADD)," said a military officer, adding some 1 trillion won (US$928.2 million) will be earmarked for its development and production. "The spy satellite, which is capable of securing imagery intelligence on the Korean Peninsula and the surrounding regions, is the key detection asset for the country’s preemptive strike apparatus of the Kill Chain and the Korean Air and Missile Defense (KAMD) system," he said on condition of anonymity. In a bid to ensure a stronger deterrence against the belligerent North, South Korea has been developing the KAMD, a low-tier air defense program, and the Kill Chain, which is designed to launch strikes right after signs are detected of imminent nuclear or missile provocations by Pyongyang. The satellites, powerful enough to identify objects as small as cars, will be equipped either with high-resolution synthetic aperture radar or an electrooptic-infrared (EO-IR) surveillance device, another officer said. "A total of five units will be put into service by 2022 starting 2020," he said. "The satellites will allow us to detect North Korea’s transporter erector launchers within some two to three hours of their deployment." The Seoul government also plans to launch a project to develop its long-range, surface-to-air L-SAM missile with its indigenous technology in order to shield against the North’s guided missiles, according to the officials. The development of the L-SAM system, which intercepts missiles at an altitude of 40 kilometers or above, aims to shoot down ballistic missiles from the communist North in their terminal phase. "The L-SAM development is expected to greatly increase the capacity of the KAMD by allowing us to secure a multi-layer system," an official of the Defense Acquisition Program Administration said, noting that low-flying missiles that are in their terminal phase can be destroyed by the Patriot PAC-3 and mid-range surface-to-air missiles, or M-SAM. The L-SAM system is compatible with the Terminal High-Altitude Area Defense (THAAD) battery, which is an integral part of the U.S.-led missile defense system. Despite a growing push from Washington, the Seoul government has rebuffed a request to join the U.S. air defense system, which mainly aims to counter a rising China in the region. In order to effectively nullify North Korea’s asymmetric threats posed by weapons of mass destruction, including nuclear bombs, the ministry plans to develop laser beam-based, electromagnetic pulse (EMP) and high powered microwave (HMP) weapons, among others, by the early 2020s. In a move to beef up maritime defense particularly near the western sea border with North Korea of the Northern Limit Line, the ministry has been working on developing an unmanned battleship and earmark 20.2 billion won (US$18.7 million) this year. 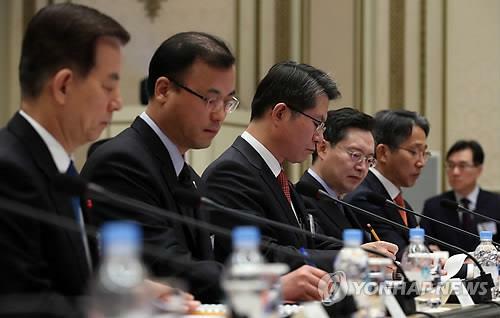 "The integration of defense tasks with state-of-the-art scientific technology including information communication technology and the Internet of Things (IoT) is necessary to be fully prepared for the future where we should meet diversified security threats with limited financial and personnel resources," Defense Minister Han Min-koo said. "We will strive to secure defense capabilities to counter enemies’ asymmetric power and overwhelm them with a mid- to long-term goal," he added.